Hiring a personal trainer is something that for most people can be quite daunting and frankly they don´t know where to start. In this article I want to outline what you need to look for when hiring one and what should make you run a mile. The biggest problem with personal trainers these days is that it takes barely any thing to become qualified and because of this it seemed like everyone and their dog was trying to be a trainer a few years ago. 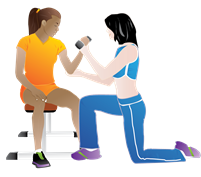 So what do you need to look out for when deciding to hire a trainer. The first thing to keep in mind is that the big chain gyms are more focused on money than quality and will generally hire anyone who applies for a job. Most experienced and respected trainers left the chain gyms a long time ago to work for smaller more private gyms or to set up their own studio. That is not to say that there are no good trainers in the chain gyms, but you´ll have to look harder to find one. If you have a gym membership you are in a unique position to study some of the trainers and watch how attentive they are to their clients and how busy they are, good trainers are usually busy trainers. The second thing to keep in mind is that you need to find a trainer who specialises in what you want. For example it´s no good hiring a trainer who specialises in weight loss when you are after sports specific training. Most trainers have three or four area of specialty so you should have no problem finding a match. Check out their recommendations and history, is it good? do they come highly recomended? The third and most important thing, try them out! almost all trainers will offer a three taster session. During this they should give you a taste of what you will be doing in relation to the outcome that you´re after (e.g weight loss) Do you get on with them? is there service good? what are their price plans?can they train at the hours you want? Those are all questions that you should get the answer to during the taster.